Night Watchman Doorstop Alarm | BUDK.com - Knives & Swords At The Lowest Prices! Measures 1 3/4" x 1 1/2" x 5 1/2"
Alarm systems can cost thousands of dollars and up to $100 per month to monitor. 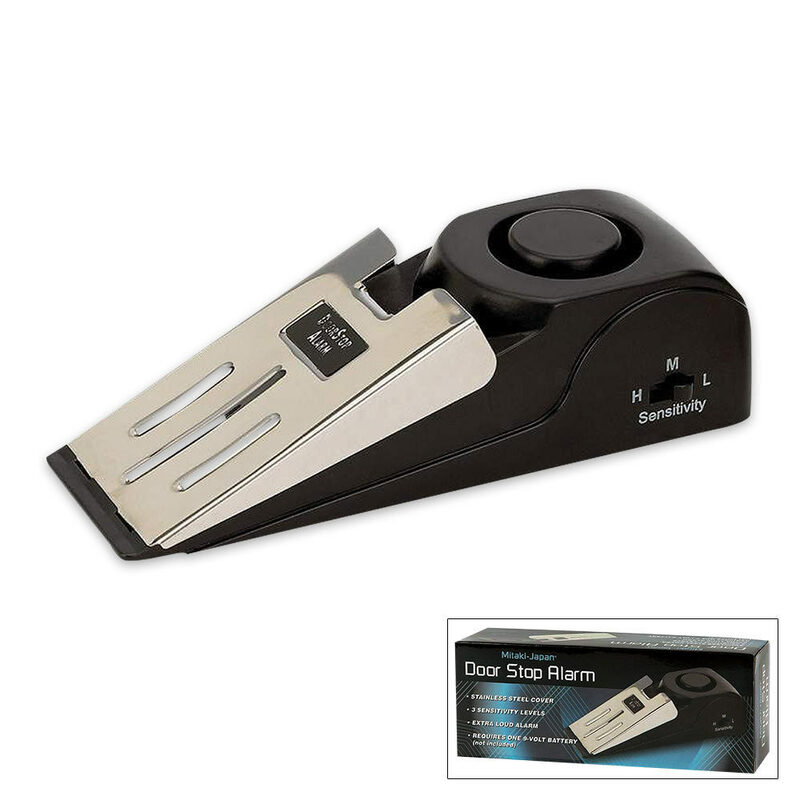 This simple doorstop alarm will cause intruders to run the opposite direction with its ear-shattering high-decibel alarm. Your neighbors will surely hear the alarm and notify the authorities to the vandals' activities. Meanwhile, you'll be enjoying the vacation you took with all the money you saved on an expensive alarm system. Don't wait to buy; this $5 item could save you thousands! Great product at a great price. $6.99 for 3 is unbeatable deal. Use 9 volt battery, 3 modes sensitivity, on "H" mode you just touch it and it goes off. Quite loud and I highly recommend for all to use as door stopper or alarm. Remember to turn off when not in use so battery will be drain off. I am a big fan of BudK but this particular item is junk. Good news: It claims to be loud and it definitely is loud! Bad news: It claims that the rubber on the bottom keeps it from sliding---this is untrue. I tried it on all three of my doors and it simply glides across my wood floors (without the alarm going off) whenever the door is opened. It was in my trash can within 20 minutes after I received it! 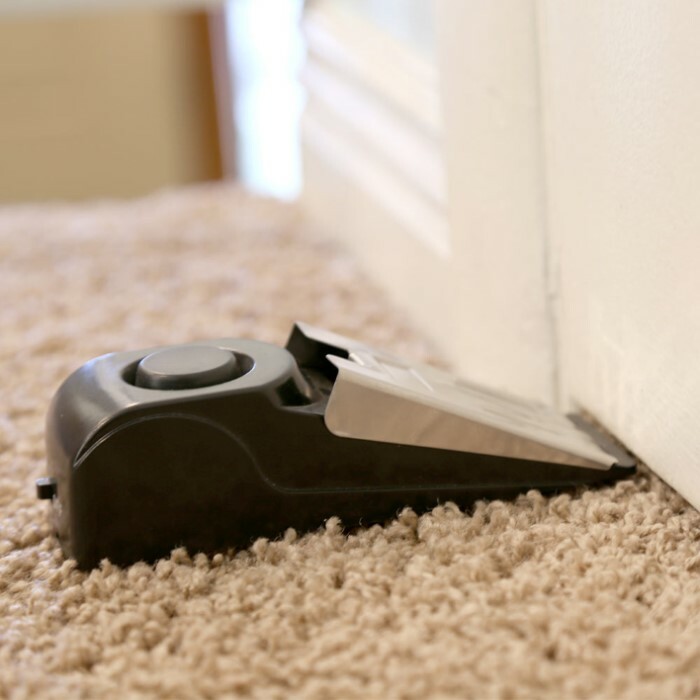 Perhaps it works well on carpeted floors but did not work at all on wood flooring! I have two and they work GREAT! VERY loud we can even hear it upstairs! I purchased two of the Mitaka-Japan Door Stop Alarms. One worked great...the other would only work 1 out of 5 times. I returned the defective alarm and received another one. It works fine. It gives my wife and granddaughter that little extra security when alone. I bought this item and was pretty stoked about it. Unfortunately it only worked a couple of weeks then quit. Changed to a new battery and still doesn't work. Dissatisfied overall. It's loud! It will wake you from a deep sleep ! No one can open your door without you hearing them! Awesome product. It really works! Nice product for security and peace of mind. Caught 3 family members so far.....even caught cat pushing the door open further once. Simple and they work.